Southwest Michigan (August 16, 2018) – In response to the needs of business and industry across the state, Michigan Works! Southwest is excited to announce the availability of training dollars to assist businesses in expanding their pool of skilled workers. Through the 2019 State of Michigan Going PRO Talent Fund, formally known as the Skilled Trades Training Fund, $27.6 million in funding is available to Michigan employers. The Going PRO Talent Fund, also known as simply the Talent Fund, provides funding to employers for customized short-term training to enhance the skills of current employees, encourage new hires and expand apprenticeship programs. The goal of the funding is to ensure Michigan’s employers have the talent needed to compete and grow in a global economy. Prior to the start of the Going PRO Talent Fund application period, Michigan Works! Southwest is holding Employer Information Sessions to inform businesses about the application process and funding requirements. The information sessions will be held at various locations throughout Branch, Calhoun, Kalamazoo and St. Joseph Counties between August 13 and September 20, 2018. Companies can apply for this competitive grant through their local Michigan Works! office beginning September 12, 2018, with an application end date of October 3, 2018. 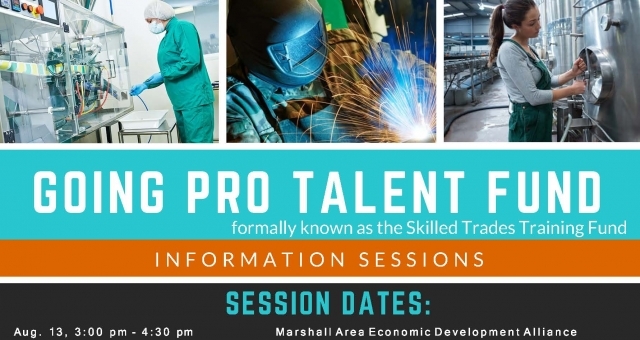 Further information about the Going PRO Talent Fund and the complete schedule of information sessions can also be found online at www.michiganworkssouthwest.org/employers/going-pro-talent-fund. Michigan Works! Southwest specializes in talent development strategies for employers and job seekers. Services can be accessed at any of our service centers which are located in Battle Creek at 200 W. Van Buren, in Coldwater at 210 Vista Drive, in Kalamazoo at 1601 S. Burdick Street and in Three Rivers at 16587 Enterprise Drive. Additional information is available online at the Michigan Works! Southwest website www.michiganworkssouthwest.org. To find other Michigan Works! locations visit www.michiganworks.org or call (1-800) 285-WORKS (9675).